If you are entering the accounting field, you can take your pick from a wide array of positions. Different accounting jobs have different educational requirements, so it’s wise to decide on a career objective right away. A great place to start is by considering the top accounting jobs that are available today. Contrary to popular belief, tax accountants are busy throughout the year and not just during tax filing season. These professionals’ starting salaries range from $51,000 to more than $75,000. Their work mostly revolves around preparing and filing income tax information for individual, government and corporate clients. They take steps to reduce their clients’ tax liabilities through an in-depth understanding of tax laws and regulations. These laws and regulations are constantly evolving, and tax accountants must stay on top of them to deliver optimal results for their clients. Tax accountants also educate clients about the tax implications of proposed business plans, life changes and the like. According to the Bureau of Labor Statistics, auditors earn a median salary of $65,940. Supervisory auditors earn an average annual salary of around $92,000. Auditing involves assessing the fairness and accuracy of an organization’s financial statements to ensure that all financial information is valid and legal. Auditors also test internal methods that are used in clients’ accounting systems and review and give advice regarding accounts. External auditors investigate financial information on behalf of taxing entities and government authorities while internal auditors help bring companies into compliance and assist in improving businesses’ financial controls. Cost accounting is the process of measuring the cost of producing goods and services. Cost accountants determine the fixed and variable costs that are needed to produce a good or service, which typically include the cost of equipment, human resources, research and development and marketing. This information is used by corporations for product pricing and budgeting purposes. Therefore, cost accountants’ work directly impacts a company’s profitability. 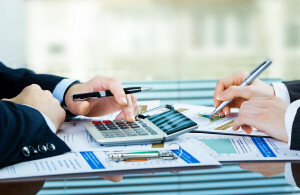 Cost accountants also typically work with executives and managers to develop financial strategies for organizations. These professionals earn a median annual salary of $66,340. One of the most lucrative accounting jobs is forensic accounting, which involves investigating and analyzing financial records for unusual activity and other irregularities. Forensic accountants are often hired by law enforcement agencies and attorneys to investigate crimes like embezzlement and fraud. These professionals use the evidence that they gather to reconstruct financial events, and they are often asked to testify as expert witnesses in court. Companies also sometimes hire forensic accountants to develop strategies for preventing fraud in the workplace. These accounting professionals earn an average starting salary of between $69,000 and $102,000. Accounting managers manage the professional-level accounting functions of businesses. They are typically tasked with preparing financial information for various internal users of an organization, including executives and managers. They examine a company’s financial information for forecasting purposes and are typically required to prepare, submit and present reports, including profit and loss reports, earnings reports and cost accounting reports, on a weekly, quarterly or yearly basis. The confidential reports that they prepare are used in important decision-making activities. Accounting managers earn an average salary of between $45,000 and $65,000 per year. Many of today’s top accounting jobs require advanced degrees. Most of these positions also require decent amounts of experience. If you aspire to hold one of these positions someday, begin by enrolling in and completing the appropriate degree program.